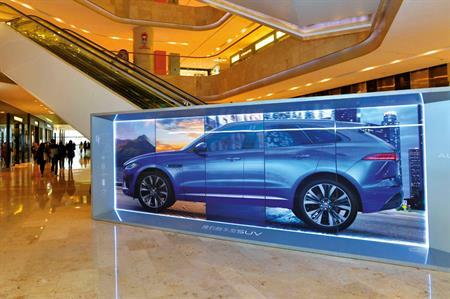 C&IT's Best use of Event Technology and/or Social Media award was won by TBA for its Jaguar F-PACE Lenticular and iSender Experience, which showcased the vehicle without it being present. The launch of the Jaguar F-PACE was a key moment for the brand, representing its debut into the SUV market. TBA was asked to create an innovative experience that showcased the vehicle to potential customers, but without the vehicle. The experience had to be suitable for public spaces such as airports, shopping centres, outdoor squares, as well as existing VIP Jaguar events and dealerships. TBA created an imposing, stand-alone 1:1 scale visual of the vehicle using the latest 3D lenticular technology and stunning 2D imagery, to demonstrate the size but also the practicality and capability of the vehicle through moving imagery. Using iSender technology, it was able to push a Jaguar wi-fi to devices within a radius of approximately 20m to the experience. Once the user opened their browser they were taken to a simple, scrolling app page of additional information about the F-PACE. Jaguar was able to track the number of digital engagements with the lenticular and subsequently the app, and evaluate the click-through rate to the local sites. More than 2,900 customers connected to a Jaguar hotspot, with an estimated individual engagement of more than 1.1m and total number of sales at events to date of 82.